FinTech hype abounds. In the news, financial technology is described as “disruptive”, “revolutionary”, and armed with “digital weapons” that will “tear down” barriers and traditional financial institutions (World Economic Forum 2017). Although investments in FinTech have been expanding very rapidly in financial markets (see Figure 1), their potential impact on banks and financial institutions is still far from clear. The tension between stability and competition underlies the entire debate over FinTech and how to regulate it. The crucial questions are whether and to what degree FinTech companies are replacing banks and other incumbent financial institutions, and whether, in doing so, they will induce a healthy competitive process, enhancing efficiency in a market with high entry barriers, or rather cause disruption and financial instability. Our editorial in the new issue of European Economy deals especially with the relationship between FinTech and banks (Navaretti et al. 2017). Source: Authors’ own elaboration based on data from CBInsights. 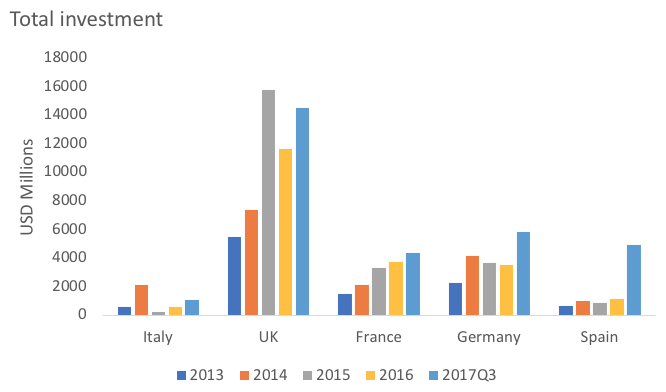 Value of total investment in FinTech companies in each year; data for 2017 refer to the first three quarters only. We argue that FinTech companies enhance competition in financial markets, provide services that traditional financial institutions do (albeit more efficiently), and widen the pool of users of such services. In most cases, FinTech companies provide a more efficient way to do the same old things that banks did for centuries. But it is unlikely that FinTech will fully replace traditional financial intermediaries in most of their key functions, because banks are also well placed to adopt technological innovations and themselves perform old functions in new ways. FinTech companies mostly provide the same services as banks, but in a different and unbundled way. For example, like banks, crowdfunding platforms transform savings into loans and investments. But unlike banks, the information they use is based on big data rather than on long-term relationships; access to services is decentralised through internet platforms; risk and maturity transformation is not carried out as lenders and borrowers (or investors and investment opportunities) are matched directly. There is disintermediation in these cases. However, such pure FinTech unbundled activities have limited scope. For example, it is difficult for platforms to offer clients diversified investment opportunities without keeping part of the risk on their books or otherwise securitising loan portfolios. And it is impossible for them to benefit from maturity and liquidity transformation, as banks do. Other functions carried out by FinTech companies, such as payment systems (e.g. Apple Pay instead of credit cards), are still supported by banks. Banks lose part of their margins but keep the final interface with their clients, and because of the efficiency of these new systems, they may well expand their range of activities. In such cases, there may be strong complementarities between banks and FinTech companies. In general, the value chain of banks includes many bundled services and activities. FinTech companies generally focus on one or a few of these activities in an unbundled way. Nonetheless, bundling provides powerful economies of scope. The economics of banking is precisely based on the ability of banks to bundle services like deposits, payments, lending, etc. For this reason, FinTechs will also have to bundle several services if they wish to expand their activities (e.g. for the crowdfunding example above) or integrate their services with those of banks (e.g. for the payment systems described above). The business model of FinTech companies, therefore, is very likely to gradually converge towards that of banks. As this happens, it is no longer clear that FinTech companies have a neat competitive advantage over banks, apart from the legacy costs that banks face in reorganising their business. Moreover, as FinTech companies expand their range of activities, the scope for regulatory arbitrage – which the much lighter regulation of their activities has granted them so far – will surely decline. 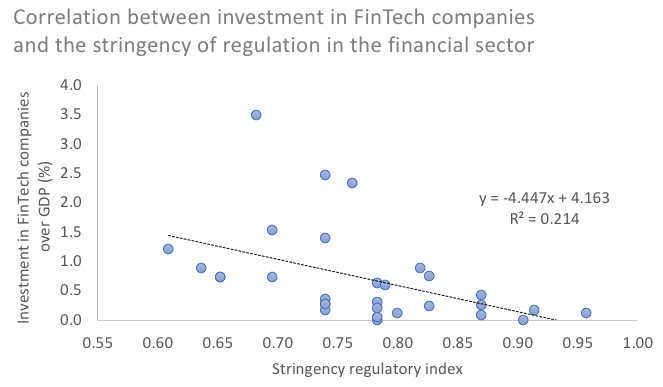 Figure 2 shows a negative correlation between the stringency of regulation and the size of investment in FinTech companies. We argue that a case by case regulatory approach should be implemented, essentially applying existing regulations on FinTech companies, based on the services they perform. Regulation should be applied when services are offered (of course with an element of proportionality), independently of which institution is carrying them out. For example, if we consider again loan-based crowdfunding, different regulatory frameworks could be relevant, depending on what these platforms actually do. Banking regulation could be unnecessary if the platforms do not have the opaqueness of banks in transforming risks and maturities, and do not keep such risks on their balance sheets – for example by collecting deposits and lending outside a peer-to-peer framework. But it should be enforced if platforms carry out such activities. In general, we need to avoid a situation where FinTech companies becoming the new shadow banks of the next financial crisis. Source: Authors’ own elaboration based on data from CBInsights and the World Bank’s Bank Regulation and Supervision Survey. Funding FinTech over GDP (%) is the share of outstanding amounts of investment in venture capital, corporate venture capital, private equity, angel investment, and other investment over GDP. The stringency regulatory index is constructed using 18 indicators from the World Bank’s Bank Regulation and Supervision Survey. Once regulatory arbitrage is ruled out and the same regulatory framework is imposed on all institutions based on the functions they perform, the playing field is levelled. Then the only competitive advantage is the one granted by technology and the organisation of activities. The framework becomes one of pure competition with technological innovation. Convergence is not new in digital industries. Amazon, Apple, Facebook, Google, and even Microsoft all started in different types of businesses (retail, computers and phones, social network, search, and software), but they are now converging to a similar set of activities that mix all the initial areas of specialisation. Interestingly, most of these conglomerates have already experimented with entry into the financial services sector, although without great success to date. However, we may expect more of this in the future. These large firms have cash, they have huge volumes of personal data, and their business models are largely based on matching consumers to their needs and network externalities that tend to generate winner-take-all outcomes. Digital innovators have been hugely disruptive in many sectors. Netflix caused the ‘bust’ of Blockbuster, and Amazon had a similar effect on many retailers and booksellers. Skype took 40% of the international call market in less than ten years. For incumbents, the deadly mix that these newcomers presented consisted of lower-costs and higher efficiency, plus better or new products and services, combined with the incumbents’ own inability to swiftly adapt to the changing landscape. But although evocative, these examples don’t precisely fit the financial industry, because banking is a multiproduct business with largely heterogeneous customers, and it is intrinsically plagued by asymmetric information and heavy regulations. Competition will enhance efficiency and bring in new players, but it will also strengthen the resilient incumbents, those capable of taking on new challenges and playing the new game. Intermediation will partly be carried out in a different way than today— more internet and internet platforms, plus more processing of hard information through big data. But intermediation will remain a crucial function of financial markets. Banks will not disappear. If some do, they will be replaced by other, more efficient ones. The real casualties will not be banking activities, but inefficient (and possibly smaller) banks and banking jobs. Navaretti, G B, G Calzolari and A F Pozzolo (2017) “FinTech and Banks. Friends or Foes?”, European Economy 2017(2). World Economic Forum (2017), “Beyond FinTech: A pragmatic assessment of disruptive potential in financial service”.